JD perished in the crash of his friend’s aircraft only two weeks ago. 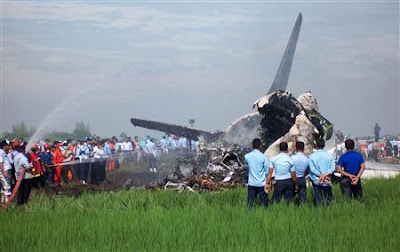 At the point when we expected JD’s details to be published in the papers Garuda Flight GA200, a 737-400 crashes in Indonesia. One of the survivors is Mick Hatton, close colleague and friend with whom I served while in the Air Force. I read his name in the papers but in the initial reports his name was not associated with the Air Force. So I figured it really could have been anyone. But the following day the press revealed his rank so I guessed it may well be my friend. That evening I saw TV images of him on a stretcher on a Yogyakarta hospital floor. The following day TV footage captured him hobbling off his flight home to Darwin with his arm in plaster and looking a bit worse for wear. It’s a thin joke around some at the moment – If you know me, stay away from planes! There is a lighter side to all the press that I know Mick will appreciate, as will anyone who has served in the military. Mick is a military policeman. And a Senior NCO at that. Over the last few days Mick has been reported in the press as an officer, and as a pilot. He is neither and the standard retort of a “I am not an officer, I work for a living” comes to mind. He is a gentleman though! And even though he looks pretty beat up here (in bed) with fellow air force crash survivor, he is a fit fellow and will bounce back. Even though he can’t catch me on Castle Hill! !